Part of Map & Land Nav Series. 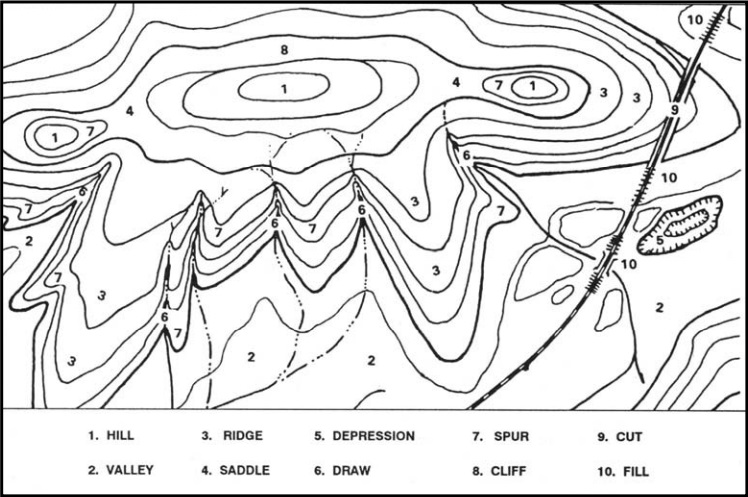 Major terrain features are hills, saddles, valleys, ridges, and depressions. Hill An area of high ground. From a hilltop, the ground slopes down in all directions. Saddle Is a low point between two areas of high ground. Valley is a stretched-out groove in the land, usually formed by streams or rivers. A valley begins with high ground on three sides and usually has a course of running water through it. If standing in a valley, three directions offer high ground, while the fourth direction offers low ground. Ridge is a sloping line of high ground. If you are standing on the centerline of a ridge, you will normally have low ground in three directions and high ground in one direction with varying degrees of slope. Depression A depression is a low point in the ground or a sinkhole. It could be described as an area of low ground surrounded by higher ground in all directions, or simply a hole in the ground. Minor terrain features include draws, spurs, and cliffs.